Whilst we're confident that CoB provides a wealth of functionality that should meet most after school and holiday clubs requirements, we understand that every business is unique. If our off the shelf version doesn't meet your needs, then we'll be happy to discuss a turn-key solution, customised around your bespoke needs. 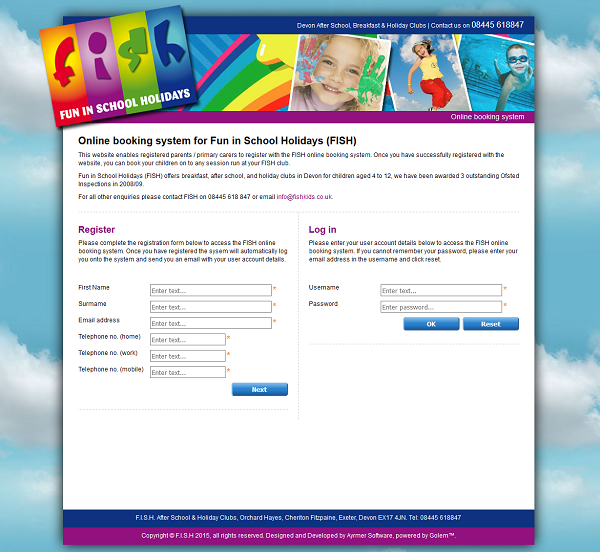 After all, our initial version of the after school and holiday club on-line booking system was developed for Fun in School Holidays and was designed and developed around their requirements. We've also developed tailor-made solutions for Busy Living, School Friend Club and Coll�ge Fran�ais Bilingue de Londres over the last few years that's enabled them collectively to process more than 250,000 bookings, in excess of � 3,000,000 worth of bookings. Alternative Payment Gateways, although we already support SagePay and PayPal. Extended reporting facilities to improve Business Intelligence (BI), enabling you to make informed decisions about you business. Additional functionality that meets your specific requirements.